1. Select the Undo option from the drop-down list. The Undo button, which sports a blue arrow curving to the left, appears immediately to the left of the arrow you clicked in Step 1. TIP The keyboard shortcut for undo is Ctrl+Z. This shortcut works regardless of whether the Undo button is on the screen. 2. 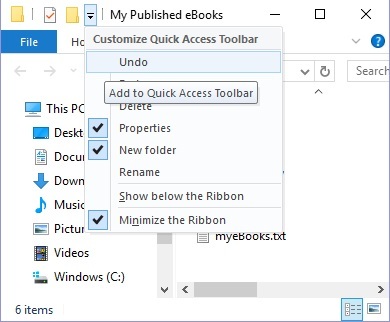 Select the Customize Quick Access Toolbar button again. Note that you can also add the Redo button, which, as you would expect, undoes the undo. All the other options appear also on larger buttons on the Home tab, so you don't need to add them to the Quick Access toolbar. If you're a first-time, over-50 Windows user looking for an authoritative, easy-to-follow guide to the basics of this new operating system, look no further. This no-nonsense book cuts through confusing jargon and covers just what you need to know, providing lots of helpful figures along the way! Whether you're upgrading to the new Windows 10 operating system with the hopes of keeping in touch with loved ones via webcam or social media, or simply want to make your life more organized and streamlined, all the help you need to make the most of Windows 10 is at your fingertips. You'll find out how to navigate the interface with a mouse or touchscreen, manage printers and other external devices, store files in the Cloud, send and receive email, listen to music, and so much more. There's no easier way to get up and running on the new Windows operating system than with Windows 10 For Seniors For Dummies.